British actor best known for roles in films like The Italian Job, Alfie, Get Carter, The Ipcress File, Sleuth, The Dark Knight Trilogy, The Prestige, The Man Who Would Be King, Hannah and Her Sisters and The Cidar House Rules. At fifteen I was nearly six feet and as skinny as a rake. I was six feet two and weighed a hundred and seventy-five pounds. I think Ewan McGregor, Stephen Dorff, Joaquin Phoenix, Ryan Phillippe and Tobey Maguire are wonderful actors. There are many other fine actors in Hollywood. But... I've never seen a tall one. It seems to me that there's a generation of very talented small people... maybe they are more ambitious because they are more angry because they are short. To be taken to the country in the fresh air, with exercise and everything, I sprang up. By the time — I'm 6 feet, 2 [inches], but by the time I was 14, I was 6 feet tall. Yeah Connery for the most part edged Caine. 186.7cm peak and 184cm now. Peak Connery had a strong half inch on Caine. Movieguy12 - Agreed re Caine and claimed 6'2" - close but no cigar - a bit under. However, as you said, certainly not out of order claiming 6'2" - could often look same height as Connery and even a smidge taller - I think that might've been due to Connery's less perfect posture - Caine stood pretty straight most of the time but Sean was one of those guys who would only every now and then straighten to show his full potential and true advantage - which I think was in the realm of .25"-.5" over the artist formerly known as Micklewhite. He uses a walking stick now so he probably appears to be below six foot. I think Caine was a weak 6'2''. Height straight out of bed so to speak but for most of the day slightly under I'd guess. Not really lying about his height though. Now probably around 6ft even. I think his comment about short actors being angry is meant as tongue in cheek. Caine never looked a full 6'2". He was probably 6'1.5" at peak, and six foot even today. I'd say 6ft0.25 today and 6ft1.75-2 peak. Not bad for 85 years of age. I think caine was a weak 6'2 at peak. It's great he doesn't inflate his height (Who doesn't when they're already tall, well maybe some people). But his prejudice comment does concern me. How they got a successful acting career has nothing to do with their small (some he mentioned are pretty average) stature and with that means they automatically have a napoleon complex. They got an acting career because they worked their butts off into making that happen. It not only takes heart and spirit to become a talented actor, but they have to work with the right people to get them into that spotlight. He never looked about 6'1.5". Mr. Caine here thinks that short people are angry because they're short. This could be one of those things that tall people imagine to be true. You know: I'm glad I'm a six-footer and I pity all those guys who are not, kind of thing. Would you rather look like Robert Conrad (short but handsome and athletic) or Michael Caine (tall but plain). I'd take door number one on that one. Most people learn to accept their bodies as they are once they realize that they can't change them very much. This is why being fat is such a bad handicap. If you're fat, you really can become not-fat, but at the cost of near constant effort. But if you're short, well, it's not your fault. He atually look more like just a decent 6 footer nowadays. I believe 6'1.75" peak and 6'0 now than a strong 6'2 peak. I would place Sir Michael at a genuine 6'2" in his prime. I couldn't say what he is today. In Deathtrap, his co-star Christopher Reeve, who stood 6'4", was definitely about two inches taller. Exactly the same height as Connery. Probably 1.87 peak. Michael Caine is one guy, who is like a roller coster, keeps getting better with age. Amazing voice cameo in Dunkirk, reminded me of his Battle of Britain role. 6'0.5 today. Peak 6'2.25. Amazing actor. One of the legends of the 20th and 21st century. I think the lowest you could argue is 6ft1.5 for Caine. Even that would do him an injustice I think, peak he'd be in that 6ft1.75-2 area. Didn't look as low as 6ft1 range. Caine usually looked 6'1" in films. Caine's peak height should be downgraded as he never looked 6'2". Hawkins didn't really become famous until he was middle-aged so it's difficult to say. I think that he was 5'11. But he could have been 6 too. Are you sure Hawkins was 5'11"? He looked taller than Stanley Baker in "The Cruel Sea". Ok. But only take a look of pictures of otoole and hawkins in real life. Otoole was taller. Jack Hawkins wasn't at the beginning of "Lawrence of Arabia". That was Sir Donald Wolfit. Otoole was 6'2 or close. He was taller than harris, who was about a weak 6'1-strong 6. Hawkins was in the 5'11-6 range. He was only taller than otoole when they have different footwear. At the beginning of the movie, when otoole was also wearing military uniform and boots, otoole was clearly taller than hawkins. O'Toole was shorter than Jack Hawkins in all their scenes together. O'Toole wasn't any more than six foot, like Richard Harris. O'toole was clearly taller than hawkins in real life. If hawkins looked taller than otoole in some scenes, this could be because the footwear.hawkins was wearing military boots and otoole normal shoes or arabian sandals. Hawkins was clearly taller than Peter O'Toole in "Lawrence of Arabia". If O'Toole was 6'2" then Hawkins must have been 6'4". O'toole was close to 6'2 peak, if not a weak 6'2. Hawkins was a tall man also, but o'toole was taller. O'Toole wasn't even six foot, he was shorter than Jack Hawkins. He is a lot shorter then Morgan Freeman in Now You see me. 6'0.25 these days and 6'1.5 peak for Mr Caine. I think Caine is a little bit lower than 6'0.5". Rob, who do you think was tallest out of Caine, Hackman and O'Toole in their primes? Editor Rob: they all could be argued between 6ft 1.5-2 range, although all given 6ft 2...I could understand estimates under 6ft 2 for them all. I'm not sure anybody would stand out as the more solid 6ft 2 man. 6ft1.75-2 peak and 6ft0.25 today. Arch, I think 6ft2 is still an okay listing because he did look it more often than 6ft1. But the chances are higher that he might've dipped under it slightly at worst compared to someone like Connery who could look over it and probably held that mark at his low. A full 6'2 seems a tad high, I would go with 187 range myself. You can tell Caine was never 6'2" in his films from the 1960s. He was either 6'1" or 6'1.5" at his peak. Nowadays at 84 he is exactly six feet. I have just started watching for, say, the fifth or sixth time, the fantastic 2009 movie, 'Harry Brown'. Michael plays the title role and has just received the dreadful news that his only remaining friend has been murdered, a fate which the friend has feared would be very shortly on the cards. I can feel my eyes welling up already; I know what is to follow and it is far from pleasant. It's full of swearing, but absolutely none of it is gratuitous. It boasts a top-notch cast, but the acting acolade goes to the well-seasoned actor, Michael Caine. If you haven't already guessed, there is a 'take the law into your own hands' theme in this, but until you see it, only then will the time be right to agree or otherwise with how the elderly Harry decides to deal with what has happened to today's society and the country he fought for decades ago. I started watching this film to see how much height Michael might have lost since the 8 years it was made. He looks a good 6ft0.75 - 6ft1, but I have noticed so, so much more than that! This fine actor has always managed to put real emotion into his performance and, more so than ever now, has continued to do so. Many examples are among my DVD collection - not bad for someone who told her boyfriend in reply to being told that he used to live next door to Mr Caine's cat-loving half-sister, "Oh, I like him, but I'm not really a fan!" Peak height? A good 6ft2, and today's height can't be much more or less than 6ft1, so that's where I will settle! I photo doubled for Michael in a recent film production. In identical footwear, he was about an inch shorter than my 6'1.5, mostly because he stoops a bit. His current height should be downgraded to six foot. Of course, S.J.H. Height loss varies greatly among different individuals just as height itself, aging and every other physical characteristic varies greatly. Morgan Freeman is only 4 years younger than Caine and doesn't even seem to have lost an inch. Caine was clearly never 6'2". More like 6'1", and 5'11.5" today. Rob, he is 84 years old. The average male shrinks 2" by 80. He is MAX 6'0" today. Editor Rob: today, six foot on the nose is a good probability for him. My grandfather turns 85 this year and he didn't lost over 1.25' as peak 5'10.5 and still manage to measure 5'9.25 recently by my dad. Shrinking 2' may be true but not for all old folks depends how well they holding their posture and health status. My granduncle (grandfather older brother) now at 91 and he only lost a full inch the last time since last year i met him he still standing pretty straight and look legit 6'1 like the past 17 years i could remember he didn't lost a single height at peak 6'2 in his 20s to late early 70s of age start losing an inch according to my grandfather. One example Sean Connery keep it quite well i saw few picture of him taken in 2013/2014 in his 83,84 of age look like he only loss half inch or max 2cm if he was 6'2 peak. He seems 188 cm when he was younger, 187 cm when he passed his 50 years old. And 184 cm nowadays. He lost 4 cm. He is an old man 183/184 cm is very credible for him nowadays. Good actor. I reckon he was a 187cm guy at peak. I can buy a full 6'2 of course, but I suspect he was closer to 187. He has better posture than Graff. He's probably struggling with 6'0 now. I think he was 6'1.5 and now 6'0.5. He looked a good deal shorter than Morgan Freeman in the intro to the Graham Norton show, would've thought hes under 6 ft now. But he does still have an inch on Zach Braff and doesn't look much shorter than Freeman at the premiere of Going in Style (Click Here) so may well be 6 ft 0.5. Actually no I take that back. I still think when stood well today he can look the full 6 foot and peak I think he looked roughly 6ft 2 I don't think there's any concrete evidence to speak of to warrant a downgrade to 6'1.75 even though it's possible. I think 6ft flat today and peak 6ft 2 would be very fair. Rob, surely he isn't anywhere near 6ft 1 today ? He struggles to look 6ft I think today as of 2017. I'd wager 6'1.75 peak and 5'11.75 today I think. 2 inch loss age 84. I'm a set hand / carpenter and did his latest film. I'm 6ft dead, and he is exactly the same height now. Still a tall dude. 6'2 peak is correct. Sean Connery was always 1-1.5cm taller than Michael Caine. He could measure 6'2" in shoes. Editor Rob: he certainly could look it in the 60's, and his type of character, acting etc adds to his persona on screen. It's obvious he was never 6'2" as he never looked that height in anything, not even in "Zulu" next to Sir Stanley Baker. Caine was 6'1" at the very most. He gave his peak height as 6'1" in his 1992 autobiography. Editor Rob: in his What's it All About I saw him call himself 6ft 2 on about 4 occasions. Also said at 15 he was almost 6ft. @James, link to this claim? Caine needs downgrading slightly, by his own admission his peak height was 6'1". Connery was 6'1.5" and Caine was 6'1". The more I see of Caine's older films the more he looks 6'1 range I think. I think 187 might be nearer, but he was very close to Connery. @Rob, seeing him with 6'4 John Philip Law in Hurry Sundown it's very difficult to see Caine at a full 6'2. He could look almost 3 inches shorter in fact. With Steve Martin tough to see him at 6'2 too. Maybe 6'1.5. You can't have Garner at 6'1.5 and Caine at 6'2 haha. Editor Rob: Caine has had 6ft 1 and 2 descriptions, he has always seemed to give 6ft 2 though...he may well be a 6ft 1.5 guy. Seeing as he still looks 6'0.25 today do you really think an 83/84 yr old would only have lost 0.75 inches from his prime ? That would be pretty darn unique. 6'1" was his peak height. I would normally have said someone like Caine in '88 aged 55, a smoker and slightly overweight, would have lost a good cm. The problem is though is generally he's been a guy who has done well holding on to his height, even today aged 83 he still looks at least 6ft and could 15 yrs back still look 6'1-2 range, which makes it seem unlikely he'd have lost anything much by his mid fifties. 187.5 peak and 187 flat in the late 1980s. 184 today. I think he looked about 2 inches taller than Steve Martin in dirty rotten scoundrels. Mmm looked nearer 186 with Steve Martin in Dirty Rotten Scoundrels. Had he lost height by '88? Caine was never more than 6'1". 6'2" was clearly with shoes. Rob, how likely is 6ft flat today? Editor Rob: it is becoming more likely. In his autobio he actually writes his height as 6'1" ....don't know where these quotes are from of him stating that he's 6'2 ... Perhaps he meant in shoes.. I not sure why he would change his mind otherwise, surely you'd be most truthful in your biography and least when you are making a few throwaway comments at interviews or whatever?? 35-55 is middle age so yeah around 35 is the start of middle age therefore early middle age. I'd say being young stops at about 33, 31 i still young but at the end of it IMHO. Caine looked 6'1.5"-6'2" in movies peak to me, now due to shrinkage looks like a solid 6'0" to me. Of course 34 is early middle age. Once you're in your late twenties you know you're not young any more. Caine and Connery were both middle-aged when they became famous. Caine was 34 when he arrived in Hollywood in 1967. He was in early middle-age. Caine probably had small lifts in "The Man Who Would Be King". It was quite obvious he was never 6'2". @ Rory. I couldn't agree more with you that a 31-year-old is no way in early middle-age! Whoever said that must come from an incredibly old-minded family! 31 is a fantastic age, as you still have your looks and you have the added bonus of confidence, which is pretty thin on the ground at, say, 20! Michael Caine starting his acting career at 31 is by no means late by today's standards or those of his day. Look at Dustin Hoffman - 30 when he played the title role in 'The Graduate'! Michael Caine had, and still has, height on his side; Dustin Hoffman is a short 5ft6, but both actors have had staying power because they are so good! This is one example where talent really has been prevalent. "Already in early middle age when he became famous"...At age 31, really ? Don't think so. I think caine was close to 6'2 at peak, but not a full 6'2. A strong 6'1. About 186 or 187. 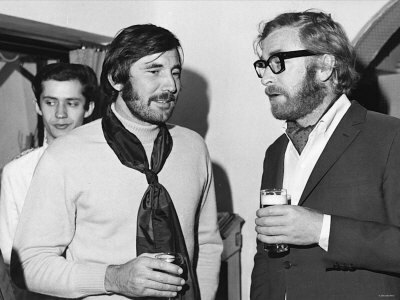 Caine was a lot closer to the camera than Lazenby. Caine was wearing built up shoes in Alfie, as he was already in early middle-age when he became famous. Disagree. Saw Alfie again recently and could look a full 6'2 a lot. Perhaps 6'1.75. Editor Rob: look at Caine near Lazenby here. You could tell from his films that he was never 6'2". 6'1" or 6'1.5" maximum. Yh for his age he's held his height very well, at most he's lost 1.5 inches aged 83.
problem I've always had with Caine isn't so much believing he's 6'2 as his posture is generally so poor that he never looks his height and I could believe he was every bit 6'2 and maybe a bit more. Generally you see very few photos where the floor, footwear etc can be verified, with other actors where he doesn't have a slight slouch of shoulders/neck/head. I do find it laughable that some are taking his appearance next to the likes of Bale, when Caine is in his 80s and saying barely taller so never 6'2. 6'1.75 peak, 6'0.25-5 today. I can't see a case for him being as low as 6'1 peak, minimum 6'1.5 Imo and his 6'2 claim is perfectly reasonable. Rob, how likely is 6ft1 flat peak? Editor Rob: I think he was taller than it, I wouldn't go that low, even though he had that listing early in his career...he seemed to claim 6ft 2. Caine was 6'1" at his peak, you can tell from his early movies that he was never 6'2". Connery at a strong 6ft2 and Caine a weak 6ft2 is what I always saw going with photos of them together and/or the same actors in separate scenes/movies. In Man Who Would Be King, Connery was bald and Caine had boots and a helmet. Honestly in the Man WHo Would be King I couldn't decide who was taller out of Caine and Connery, either could look to have the edge depending on the scene. They were very close in height. Always a chance of just under 6 ft 2 for Caine. Somewhere 6ft1½-6ft1¾ peak I think if we're gonna be ultra precise. I'd lean more on the latter though. Caine was 6'1.5" at his peak. Funny Ive just seen a photo of him standing next to Sidney Poitier who is listed as 6ft2.5,and Poitier looks about 1.5 inches taller than Caine. Hes lost just an inch i think, at most 1.5 inches which is good going for an 83 yr old. So the smoking James obviously didn't do him any harm. No, 189 would make him taller than Sean Connery. Caine was 6'1.5" at his peak, but because he smoked so much he lost an inch over the years and is now closer to six foot. I opened the door to him a couple of years ago (I'm tangentially involved in the film industry) and he is one very tall pensioner. I'm over 6'1" and he was at least my height even as recently as two years ago. Rob, maybe Caine is another for the 6ft1¾ pile? I'd with B peak then. He might have dipped slightly under it in the late evening. Rob, which range is most likely at peak? Editor Rob: Caine peak I'm still open to the chance he wasn't quite 6ft 2. I wouldn't have placed him as a stick-on six two guy. Barely taller (if not shorter) than bale, Nolan and dicaprio.. Can't believe he was ever 188 on this evidence. Jwwjr.,I think they downplayed his height a bit. As a 6'1.5 guy at his prime,he could be classified both 6'1 and 6'2 (former extremely rarely,though). I think 6ft2 is still acceptable. There's just a good chance he dipped a little below it at the end of the day. 6ft1 flat is low for his peak. In Bewitched (2004 movie) he really held its own next to cast that included then-6'3 Ferrell and 5'10.5 Kidman. I bet my cheese sandwich he was strong 6'1 back then. Rob was your last comment to rampage a dig at Glenn especially in the last paragraph? [Editor Rob: James, it's a general observation. With the rise of sites like facebook, twitter and in particular Instagram, many people are thinking of themselves in terms of followers, popularity etc. The autograph to such people might not be worth as much as a Selfie with Tom Cruise or whoever. Their currency is likes, followers, improving their own self-worth etc. In one of his autos he mentions being "around six-foot" about the time he enlisted, sort of implies to me an inch or so either way, but not 6'2".... 186cm would be my shout..
A lot of the younger actors are totally infatuated with themselves and think they're god's gift. It's so clear to me that some of them are in it for the money and the fame. Others...they're anger with the media intruding their privacy is understandable. From the moment they step out the door of their homes to the moment they step back in, they get swept up by an ocean of cameras. It gets nauseating after awhile and some just snap. Alec Baldwin is a prime example. Unfortunately that is part of the package of becoming quite famous. If it's not the paparazzi, it's the professional autograph hounds and in the last decade the rise of 'selfie hounds'. Rob I don't think Caine is the nicest of actors is he in real life judging by stories of his fierce temper on set and seeing him in interviews. Not a man you would want to upset and just by him giving you that 'look' you don't want to cross the line with him. Seeing him play Alfred you'd think he was the sweetest man in the world. Leslie Grantham said actors are the worst people in the world and indeed they are paid to deceive us. [Editor Rob: sometimes with films maybe it is best not knowing about personal lives of actors. In Funeral in Berlin he's about two inches shorter than Paul Hubschmid who was listed at 6 ft 4. There are scenes in Interstellar where he look shorter than 5'11 3/4" Matthew McConaughey. He us 81 years old Rob. The average man will have lost 2" by then. I think he's max 6'0", but can look 5'11" these days. 6'1" is definitely out of the question. Rob, who do you think was taller peak Connery or Caine? he was 2 inches taller than steve martin with a footwear advantage. he was never taller than 6'1. I would say he was a weak 6'2" peak and probably more 184 cm today. @Arch: That scene in Dr. No where Jack Lord frisks Connery...easily 1-2in in Connery's favour. Him and Connery could look close in height but I think its clear Connery was more of a 188 guy than Caine. I can play Alfie on the guitar in a jazz style, in fact it's one of my favourite songs to play. I nicked some of the chords from Burt Bacharach LOL!! Rob can you add a photo from Alfie/Get Carter days? Yeah I think you're right Rampage it was a tough call really but both around that 6 ft 2 mark. Connery in some scenes in Goldfinger and Dr. No in particular yeah he could seem a 189-90 guy at times. Walking down the hotel corridor in Goldfinger and Dr. No (with Ursula) he could look near 6 ft 3, but he was a good 2 inches shorter than 6'4" Rik van Nutter in Thunderball and didn't seem that much taller than Jack Lord in Dr. No really. I can't decide who edged who in The Man Who Would Be King. Just when you think Caine edged him out Connery could seem a bit taller. I think they were very close. Could you beef up his credits? "best known for roles in films like Zulu, The Ipcress File, Alfie, The Italian Job, Sleuth, The Man Who Would Be King, Hannah and Her Sisters, The Cidar House Rules, The Prestige and Christopher Nolan's Dark Knight series". I preferred The Quiet American to Cidar House Rules but he won an Oscar for the latter so I deferred. Also tough to leave off Dirty Rotten Scoundrels, A Bridge Too Far, Dressed to Kill, Educating Rita, Mona Lisa, Little Voice, Quills, Children of Men, Inception and on and on! Despite slumming in a bit of dreck here and there, Caine truly has had a career to be proud of. The 6ft1¾ could be a better fit but I wouldn't go lower than 6ft1½ though. He's still 6ft1 today and agree he's hasn't lost as much height as Connery through the years. If you're gonna have Connery 6ft 2 flat 6ft 1.5 will be spot on for Caine. Rob, i think you should downgrade his peak to atleast 6ft1.75in 187 cm he didn't look a full 6ft 2next to Connery downgrade Rob? At peak height I would give Michael Caine 187cm but today I think he is a strong 6'0 or 184cm. Filmfan, Alana Alda didn´t act in Hannah and her sisters. Are you thinking of Sweet Liberty? Six-one in his younger days. Just over six feet today. It's amazing to see some of these actors in person because hardly any are the height they claim. Almost every actor I've seen in the flesh was shorter than their bio claimed. There were a handful,of exceptions. John Wayne was definitely six-four. Steve McQueen was close to, if not five-ten. George Segal was five-eleven as he claims. From "The Magus" (1968) Caine was 35 and Quinn 53. We both frequent the same shop on Oxford Street and I have, on numerous occasions stood next to him. He's 6'1" dead on. I think 187-188 cm range at peak, he can look more 184-185 cm today. Caine looked not much more than 6'1" in Hannah and Her Sisters, as both Max Von Sydow and Daniel Stern seemed several inches taller (close to 3 than 2 in)...on the other hand, in almost all of his early British movies he seems to tower over others like an easily 6'2" guy. Connery and Caine are similar, though I think Connery might a slightly stronger 6'2" than Caine is based on the comparison. Rob can you add Alfie and The Ipcress File? Really does look about 6'2" in Get Carter. Good point rampage. I still think for the most part connery didn't seem over 6'2 but very close to it nevertheless. Caine on the other hand, while tall looked more in the 6'1 range to me. Connery could very well have cleared 6ft2 in his 20s and 30s, Lenad. Watch any of his Bond movies or even The Rock and you'll know what I mean. Caine might've been 6ft2, but there's a good chance he was more 6ft1.5-6ft1.75. Actually, 6ft1.75in/187cm is equally possible for his peak. He looked more weak 6ft2 range in Get Carter, Sleuth and the Italian Job. Connery was definitely the stronger 6ft2 guy in The Man Who Would Be King. Rob why haven't you listed Alfie and The Ipcress File, he was nominated for an Oscar for Alfie and a BAFTA for Ipcress, they're among his signature roles I think, certainly iconic in British cinema. Looks a full 6'2" in the Ipcress File. He looks about 3 inches taller than Guy Doleman who you might remember in the clinic as "Count Lippe" in Bond's Thunderball opposite Sean Connery. He was about 5 ft 11. Nigel Green looks 4 inches taller than Doleman in Ipcress and about an inch on Caine. He was listed at 6'4", I guessed him at 6'3" which would seem more likely. Seen him regularly on oxford street and stood next to him in the queue in HMV. Seemed a strong 6ft so 6ft1 standing to attention is probably correct. I think he looked 6ft2 range right up until the 90s. In Batman Begins and Dark Knight looked a bit shorter than Morgan Freeman but easily taller than Bale. He might have had a mid-day peak of 187 cm but anything less seems unlikely to me. I met Mr. Caine in the commissary of Warner Brothers when I was there with Bert Remsen . Caine was very down to earth. He seemed very tall and hi judged him to be 6' 2". I stood next to Michael Caine outside his restaurant, Langans in 1996. He was my height. It was pleasing to know that the guv'nor was 'Mum's 6 foot' ie. 5-10ish, but no way 6-2. To be fair Rob I think He must have been six two because when I met him a year or so ago we were eye to eye and he seemed a good 6'1 so common sense would say that taking into account height loss he would have been minimum 6'2 in his younger day. Maybe the army measured him at night and he came out as 187 lol. But he is very tall for an older guy and has quiet good posture. Just have to say it again. read his official biography again yesterday and it definitley has his height at the age of 22 on his army and acting records as 6'1 I dont think cain was ever 6'2. I have met him at at an old age he still seems 6'1 to me to it is feeseble that he was 6'2 and lost some height but i dont see why he or his agents would say he was 6'1 if he was 6'2. plus at 22 for boys you are in your last year of growth. 5'11 Joseph Bologna look 2" shorter than caine in 1984 Blame it on Rio, i don see over 2"
NO. 6'2". He was always a long-limbed guy, but his heavy build is deceptive and sometimes makes him look shorter than what he is. 6'2" is correct for him--like his friend Sean Connery, he hits 6'3" in shoes. Even today he looks close to 6'2"--he hasn't lost much. "Looks 6'0" just like Jim Carrey?" What are you smoking? He has 2" on Carrey, FFS! @Gus: They're onstage, they're moving around a bit, but I think that both Connery and Caine are both minimum 6'2" at this event in '89--add in the dress shoes and both are 6'3" onstage. Both men have kept most of their height; in recent photos they still look to be minimum 6'1" in older age, and still close to 6'2". Maybe 6'2 or 6'1.75 peak. In 2004 michale caine was 186cm. just look at him next too Christian bale in batman begins. Michale Caine did look just a fraction shorter than connery so possibly 187cm peak? 6ft1 in prime. 6ft nowadays. Not over 188cm peak and today he's still over 6ft. Like Sean Connery he's not lost the amount you would expect at his age. Is it still a possibility that Caine is 186cm, Rob? A true legend--the original GET CARTER immortalized him. Just watched him in a low-key--albeit gritty & brutal--film from 2010 titled HARRY BROWN. Although he was 77 at the time, he still looks to have maintained that height. He's at least 6'1" today, but I wouldn't be surprised if he was still hitting the 6'2" mark, at least in the morning hours. He was a tall man when he was young, and now in older age, he's still tall. Great actor. even in the 90s he still looked that tall...beside 6"0(183cm) Christian Bale he looks near 6"2 aswell. 6'1 guy in his prime around 6' today. Three inches taller than Laurence Olivier in the '72 movie "Sleuth". Olivier was never 5'11". Funny theres a pic where caine looks 6'3 next to seagal from the film deadly ground. this is probably how they both stood in the film. was a bit smaller than connery so 187cm at peak for him. Caine was 6'1" Peak. Connery a weak 6'2". i heard connery has claimed 6'1.5 in the past. In sweet liberty, Alda was a little bit tallere than Caine, almost the same. Same that Connery with Caine. So,i think that both Alda and Connery are true 6'2 footers and Caine was close to 6'2 at peak, but not a true 6'2. Like a strong 6'1. Just a dumb question everyone, but if Sean Connery is now agreed on this site to have been 6'2" peak, and in 1975's "The Man who would be King" he was (consistently) slightly taller than Caine, then how is it that Caine can also be 6'2"?? Was Caine 6'1.5"?, or 6'1"?. In 1986's "Sweet Liberty", Caine is in scenes with legit 6'2" Alan Alda, so what height does Caine seem to be there, compared to Alda? Michael Caine was 6'1" on "Zulu"
In the Prestige he looks 2-3cm shorter than 189cm Hugh Jackman. Looked shorter than Hugh Jackson in 'Prestige' by a few cm, would guess his peak was 187 cm and he's 185 now. In Alife I thought he looked an even 6'1 1/2.